'On the Brink', on looming cuts in London, drafted November 2009, published January 2010. Mental health under the axe - A response drafted for UNISON North Essex Mental Health Branch to cash-cutting plans to reduce mental health services, 2007. UNISON's response to Herts PCTs - Response drafted for UNISON Hertfordshire Health Branches and UNISON Eastern region to the consultation document Delivering Quality Health Care for Hertfordshire. 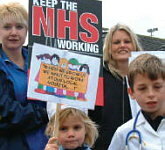 A blank cheque for privatisation - A response drafted for UNISON West Midlands Region to the 2006 proposals for a single West Midlands Strategic Health Authority. LHE has continued to work with a number of UNISON Branches to produce local tabloid newspapers, giving members and other Trust employees up-to-date information on key issues facing the union, UNISON campaigns, Health & Safety and other issues. These have now substantially improved in quality, and now, in common with Health Emergency newspaper, are in FULL COLOUR THROUGHOUT - whether the newspaper is a 4-pager on gloss, or an 8-pager on newsprint. LHE undertakes to carry out the editorial work, design the newspaper, and arrange printing: the branch is always completely in control of the content and presentation. Nothing goes to press unless it has been agreed with the appropriate branch officer. The back page of each issue is in most cases a large membership form, and the newspapers act as an effective tool for recruitment of members, stewards and reps. This service is available to all LHE affiliates. Sample pages of these newspapers (in Adobe Reader format) can be viewed by clicking on the appropriate link below. UNISON Special - PFI? No thanks! In Touch - newspaper covering the Epsom/St Helier Hospital Trust. Union eyes - quarterly newspaper for UNISON mental health branches in South London & Maudsley Trust (SLAM). 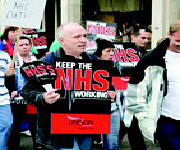 Union eyes - Kingston Hospital UNISON branch bulletin. Unison News - UNISON mental health branches in South West London (SWAG). Contact us to find out how we could help to produce a local newspaper for YOUR union branch.